> How to Tell If a Wood Pallet Is Safe for Reuse? Two BILLION pallets are used for transporting products every day. Many more pallets are lying around. It is no surprise that so many projects are made with pallets! 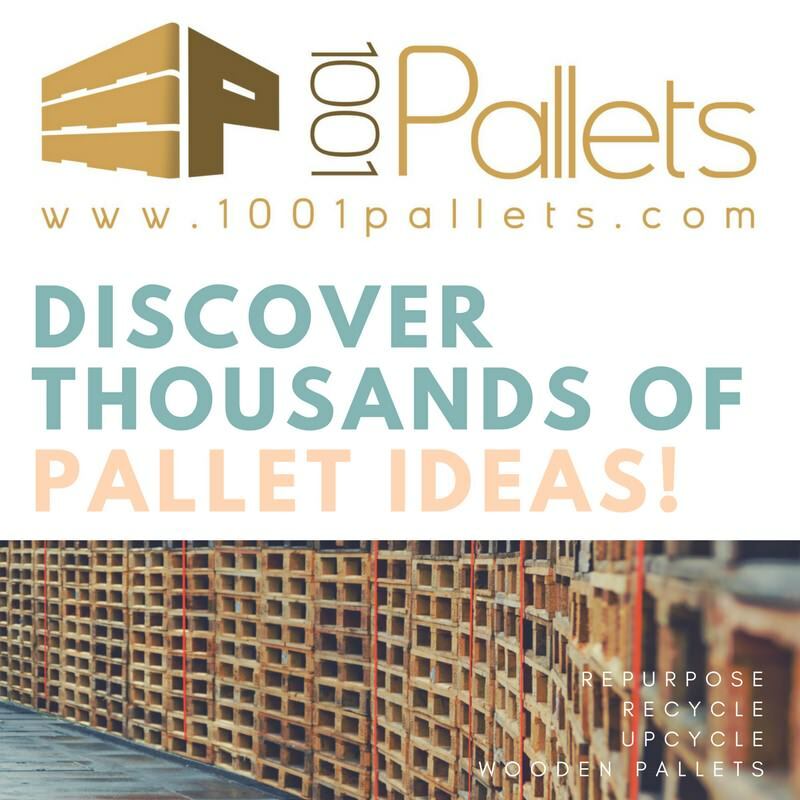 At 1001Pallets, we have over four thousand ways to recycle, upcycle, reuse, or repurpose wooden pallets! But are those pallets safe to use? Many of you have questions about pallet's safety and wonder if the pallets they found are Safe to use or not. When there is no stamp or mark on the pallet? Is it still Safe? There are Safe local sources of new pallets! There are two main things to look for on the stamp! Don't be fooled by that old appearance! Stay Safe and avoid MB pallets! Avoid "HIGHLY TOXIC" pallets! MB pallets are not Safe! Other Stamps - are they Safe? For Europe: Read the codes and stay Safe! Blue Pallets vs Red Pallets vs Brown Pallets? Are they Safe? Pallets are usually stamped with identifiers. It helps us identify safe pallets from chemically-treated pallets. We tried to summarize the information we found. Pallets can become contaminated with chemicals spilled on them during the shipping process. If there are any spills on it, either oil, food or unknown substances, do not use this pallet! Pallets are frequently used to transport dangerous or toxic chemicals/liquids. It is much safer to use only clean ones and not try to identify what might be on your pallet. It means that it is a "national pallet". National pallets are used for domestic transport within your country! Most domestic pallets are not treated with chemicals, so they should be safe. But you still have to be careful. Many crafters use these pallets safely, but it is better if you can trace from where they came. Sometimes you have to think about where you got them. 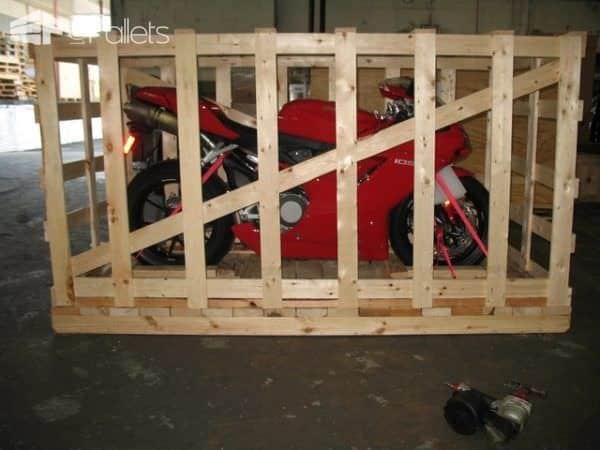 Below is an example of a heavy-duty, oversized pallet used for shipping a new motorcycle. Check in with your local motorcycle dealerships as they commonly have "come and get them" days to dispose of the stack of crates and pallets. They are all brand-new lumber! 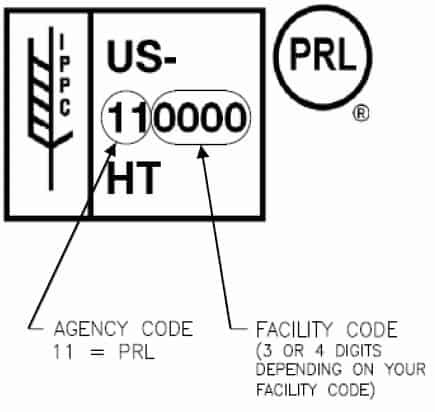 An example IPPC pallet stamp. This logo provides information including the country, the treatment it received, and more. Avoid chemically-treated pallets to keep you and yours Safe. The IPPC stamp: if you don't see it, use it with caution! A pallet may be perfectly safe without this logo, but you don't have clear information. The treatment code : [HT] = Heat treatment / [MB] = Methyl Bromide / [DB] = Debarked / [KD] = Kiln Dried. 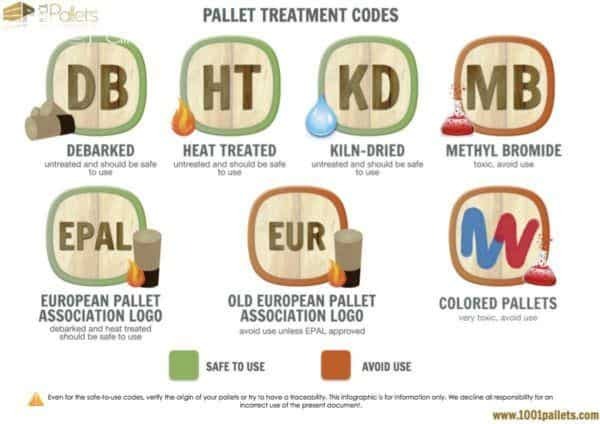 The IPPC marking on pallets is for International Plant Protection Convention (IPPC). IPPC marking on pallets are used for international shipping. These pallets are required to be made of a material that will not carry invasive insect species or plant diseases through different countries. IPPC standards require pallets constructed using raw wood to be treated. These pallets are treated with one of the methods listed below. Officially approved agencies supervise pallet treatment methods. A pallet may or may not be safe without the IPPC stamp. Stay safe; use pallets with stamps identifying clear sources! [HT]: Wooden pallets manufactured in Canada or the US undergo a pest control treatment called heat treating (HT) which involves heating the pallet to a minimum core temperature of 56°C for softwoods and 60°C for hardwoods for a minimum of 30 minutes in a kiln. HT pallets are not harmful to your health. [KD]: The purpose of kiln-dried lumber is to reduce the moisture content of the wood (19% or less). This coding system is a means to control warping, fungal growth, and other quality features.  The kilns or ovens used to dry the wood do not necessarily reach the sustained temperature of 133 degrees Fahrenheit (56 Celsius) that would qualify as heat treated. Many lumber mills are processing their timber to meet the heat treatment requirements; thus you will see "KD-HT" incorporated in the wood grade stamp. With cherry and oak wood, the curing temperature causes releases sap from within the wood. Sap coats the wood with a dark stain, making the pallets or crates appear old and worn. The heat treating process does not compromise the strength and durability of pallets and containers. KD pallets are not harmful to your health. Note: 2013-13 CPM-8 adopted revised Annex 1 to ISPM 15 to include heat treatment using dielectric heating. New, used, previously assembled, repaired, or remanufactured wood packaging material is heat treated using dielectric heating the treatment code mark is DH. [MB]: Methyl bromide fumigation, this is a potent pesticide linked to human health problems and ozone layer depletion. Methyl bromide fumigation kills invasive species like pine beetles. In 1987, the Montreal Protocol aimed to regulate the use of methyl bromide, along with multiple other chemicals found to impact the ozone. This type of treatment is now banned in Canada and many countries because it poses health risks to workers handling the pallets. However, you can still find it in some places. If you find an MB pallet (likely from Asia or Oceania), please do not use it for your craft projects or as firewood, find a waste-removal company that can dispose of it properly. Methyl bromide is a broad spectrum pesticide used to control pest insects, nematodes, weeds, pathogens, and rodents. In the U.S., methyl bromide has been used in agriculture, primarily for soil fumigation, as well as for commodity and quarantine treatment, and structural fumigation. The EPA lists methyl bromide as "highly acute toxic"! Methyl bromide has not been used since 2005 in most countries. But, as there are still old pallets in circulation, we reiter our advice to not use MB pallets in any of your projects! 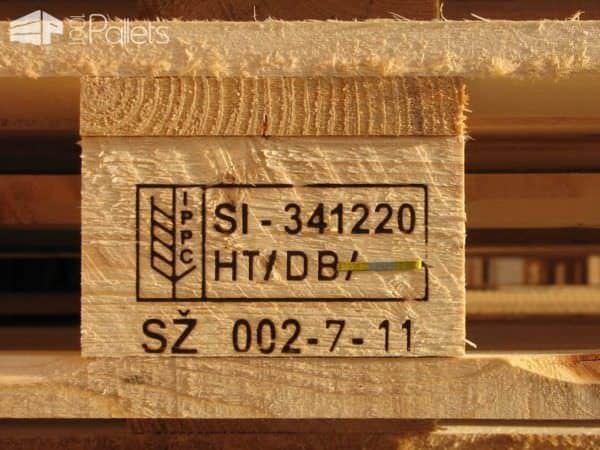 [DB]: These two letters indicate that the pallet is debarked according to IPPC regulations/stamps. Many pallets have this stamp. It does not matter if your pallet has this stamp or not. Many pallets do not have it. The process of "debarking" wood is to remove the bark (rough outer layers of wood) using a cutting tool or a planer, and the pallet wood remains untreated. This procedure is done to allow for a more thorough treatment of wood before being approved for transport (aside from smoothing the wood). Pallets marked with the letters DB only are chemical-free and safe to use. 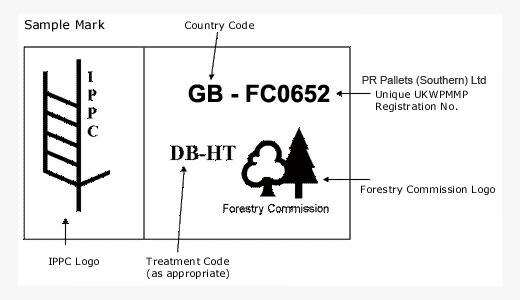 Newer pallets no longer require this stamp by the IPPC regulations, as most modern wood treatment procedures require "debarking" as a standard part of their process. Sometimes you come across other acronyms stamped on the pallets you find. This stamp indicates the name of the pallet inspection firm, a manufacturing company, or an uncommon type of wood. If you find a stamp you are unsure of and cannot validate, avoid using this pallet. Do an internet search to see if other people have come across it before. The pallet below was made in Slovenia (SI) by the supplier 341220. The pallet was Heat Treated (HT) and debarked (DB). The pallet was made in July 2011. This pallet is safe to use. For the international country code, visit ISO website. Sometimes you may also see the letters [PRL]; it means that the pallet is verified by the Package Research Laboratory (PRL). There are three stamps involved in the Wood Certification Program under ISPM 15. Stay Safe and learn how to read those stamps on the pallets. There are updated standards by PRL. 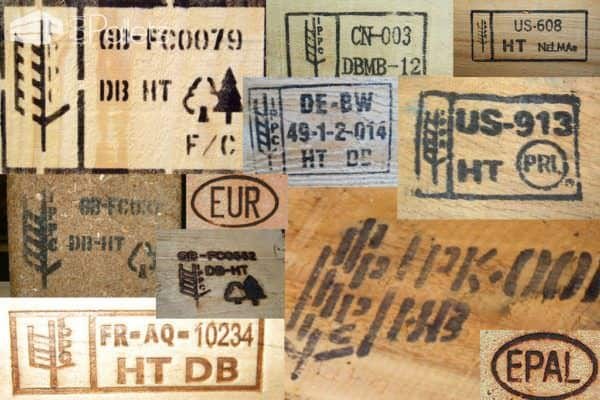 HT Stamp - Heat Treatment Certification: This stamp must be found on all lumber purchased to build heat-treated wood packaging for international shipments. WPM Stamp - WPM Certification: This stamp is required on heat treated wood packaging going into the international marketplace. It is applied on two (2) opposite sides of the finished pallet or container. If the package only shows the HT stamp, it will be rejected. MB (Methyl Bromide) Stamp - Fumigation Certification: The NWPCA has developed a fumigation program to meet the compliance issue associated with exported shipments of WPM products, as required by the USDA Animal and Plant Health Inspection Service (APHIS). Fumigators will be required to enroll in the Fumigation Program and receive special training from the MB producer regarding compliant application for WPM products. Here are updated stamps you will see on pallets as shared in a Pallet Enterprise article. A unique supplier number (0000) is assigned by the National Plant Protection Organization (NPPO). This pallet was made in China (CN) by the supplier 003; the pallet was treated (DB) debarked and fumigated with (MB) methyl bromide. The pallet was made in 2012. Don't use it; this pallet is not safe! Example of a "Euro-Pallet" stamp. The same thing applies, but sometimes there are no other stamps than EPAL or EUR. You should choose the one with EPAL. The one marked with EUR comes from an old system managed by railways companies. If they are EPAL approved, they are okay to use. They are just heat treated (HT) the same way as described above. Europe does not allow chemical treatments. These pallets can carry 1500kg. You may also find pallets without any sign on them. They are typically single-use pallets. The robust ones are those used for building materials (bricks, cement, etc. ), science equipment, machinery, and similar. They are not treated with chemicals and are safe for reuse. Many people ask where to find pallets! You may go to your nearest DIY store, home center, freight shipping company, or even search your local advertising (such as Craigslist, etc). FOR CANADA: Here is a list of approved suppliers in Canada. Pallets usually last from four to ten years. Pallet rental companies maintain them for reuse. Colored pallets usually come from one of these firms. Colored pallets (blue pallets, brown pallets & red pallets) are controversial. 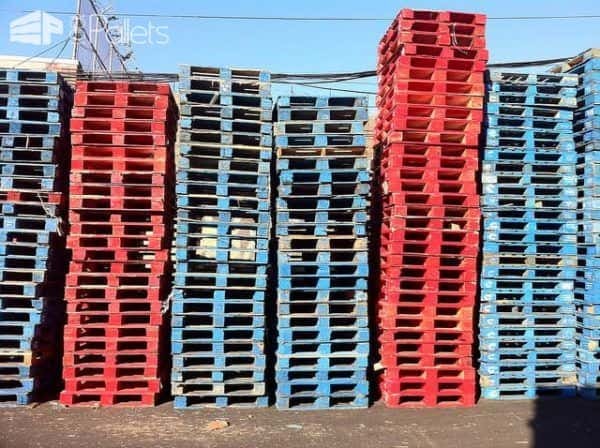 Rental companies own colored pallets. They don't treat the pallets with methyl bromide. Rental pallets are sometimes used for international shipping, so there can be concerns! Some countries are fumigating all incoming pallets. Not every country is always compliant with international standards. Note: No chemical treatments or hazardous materials are used on PECO pallets (Red Pallets), and all lumber products used to construct and repair PECO pallets receive regular testing by an independent third party inspector. You can find more information at PECO Pallet. So, the red pallets from PECO should be safe to use for your DIY project. Rental pallets are often used for international shipping, and while most countries use an NPPO/IPPC stamp marking on pallets, not all countries do. There is the possibility that some countries may not comply with standards. Remember that you should always use a mask to keep you from breathing in particles and pollutants (just as for any work involving cutting or sanding wood). One of the most important things to remember is that when you cannot establish if the pallet you have is safe or not, DO NOT USE IT for indoor projects such as a headboard, coffee table or another kind of furniture unless it comes from a trusted source. In this case, only use it for outdoor projects where you will not be in contact with the pallet too often and avoid growing food on or near used pallet wood. For your safety (and your family's), and for the sake of our planet, never use questionable pallet wood or treated lumber in your fireplace or outdoor fire pit. 1001pallets.com does not recommend using unknown or suspicious pallets for indoor projects such as cutting boards and headboards. In the video below, Karell will explain to you how to find safe pallets and read pallet codes - what pallets you can use and what pallet you cannot. That's it; now you have all the necessary information to start you pallet quest! If you have more information on pallet safety, please contact us! We will update this page to provide information that may help you stay Safe. To easily remember all the information and codes, here is a visual infographic, we hope it will be useful. PDF version available if you want to print it! Please inform your Australian readers that some heat treated packaging entering Australia is being fumigated with methyl bromide. I recently got some large shipping crates from work that had heat stamps on all timber, so I assumed it was safe. However, I learned that wooden crates are treated with methyl bromide upon arrival to Australia. It turns out that Aussie Customs still use it quite a bit. I wish they would restamp it as such. I do not trust any imported pallet in Australia thanks to Customs. One of our New Zealand readers informed us that pallets entering the country are also being treated with methyl bromide. If you are from New Zealand, do take care as well. If you want to learn more about pallets, just read our article on the history of pallets and how they play a significant role in the history of our economy. Need information on pallet sizes & dimensions around the world? Take a look at our article on this subject! If you want to know the wood used when making pallets, you can read our article "What the heck are pallets made out of?." If you need some tips and places where to find pallets, visit our Where to get free pallets? page, that will give you some advice and some areas shared by our readers. Now, you have found your wooden pallets, and you have checked that your pallets are safe for re-use? The first step is to dismantle them, and you can check our seven methods to dismantle your pallets quickly with or without tools. Then, you will need to check if you have all the tools necessary for any pallet project and finally learn how to prepare your pallet for painting with this article on the 17 things you need to know before painting a wooden pallet. And to finish, if you want to learn more or find the best pallet jack or pallet truck available out there, check out our article Tips For Buying A Hand Pallet Truck & Our Reviews Of The 10 Best Pallet Jacks! A friend has a pallet she wants to give me it’s from Italy it shows HT (heat treated) then SFN. What does this mean n is it ok to use for strawberryies please? After installing a pallet wall should I need to put a coating of polyurethane on it and if so, what kind of finish is best? Thank you. Are pallets used to transport car/ truck batteries safe to use? Plz help TRL?? Tried looking up but got confused. Luv your site!!! So it should be good but check it two times. Hi I have a terrible dark rash after moving pallets at work, itchy raised. I have tied anti histamine cream aloe Vera plant, salon. Any advice? Did you ever see a doctor? My guess would be contact dermititis from the type of wood. Fumigation with gas involves enclosing goods and woodpackaging, pumping in the gas and leaving it enclosed for a period of time to allow full penetration. Gas is used as it penetrates into the wood and then dissipates,leaving no chemicals in the wood packaging. Methyl Bromide and Sulphuryl Fluoride are both acceptable fumigants. I bought a few pallets from Toys R Us a few months ago before they went out of business. There aren’t any stains on the pallets and the only markings say Toys R Us followed by a 3 digit number that looks like a date. Should I use them or not? I Just made a bed frame out of pallets and they smell super strong. Like wood, but Is that normal? I am in France and got them at a local factory because they were longer and they had the ippc stamp but there was blue in there’s and it says it’s from Taiwan and has Chinese writing on it. I just inhaled next to the bed and I ended up coughing up a storm so now I’m feeling a little paranoid about the safety of the pallets I’m using! Bonjour Jaqui, à votre place je n’aurais pas utilisé des palettes bleu provenant de Chine, celles-ci sont en général traitées au Methyl Bromide, donc à éviter surtout dans une chambre ! can I still use them ? Thank you for sharing that sap coats the wood with a dark stain, making the pallet look old and warn. I didn’t know that heat could treat this problem without causing harm! I am looking into getting timber skids right now. I just want to make sure if I do, I know how to take care of what I’ve got. Thank you for also sharing how to be safe with this type of product! Where did you read that “pallets used to transport fresh fruit and veggies are treated with MB”? This is a great article very informative. I have read up on how to choose a pallet….i get that but how do you know if it is safe to use inside……no bugs/termites. My husband has made several comments about having them outside and having to have someone come out and make sure termites don’t get in our home……he hasn’t had anyone here for years to do that. So how can I be sure the pallets are good. Anything I can soak them in? I want to do a wall with them, like panels but dont want problems. Can anyone help with thus? You have to watch for the stamp on it. Don’t use anything stamped with “MB” – that’s an indicator that it’s been chemically treated. You’ll want “HT” stamps – heat treated. DB is just de-barked, so that isn’t of concern. If you read the full article, it’ll clarify most of your questions. But if you’re still worried, our advice is always – “When in doubt, throw it out.” You can always use our site for inspiration and use OTHER types of upcycled wood like old fencing, barn or shed wood, reclaimed wood from a house renovation, etc. – HS. Hi Very interesting article. I was wondering if there is any way to know if the pallet is pressure treated if you have wood that has been broken down for use. |Also does the chemical go deep into the wood or can you plane it down passed the treatment. MB pallet is not bug-resistant. I am using pallets to make no stoop/bending vegetable garden boxes. I want to put the pallets to good use in a healthful way as I am producing food. Regards to the 1001pallets community. Thank you for the additional information. I’ll update the post with your helpful tip! -HS. Hi Taryn – your helpful link has now been added to our pallet safety page! Thanks for your contribution! Happy Palleting! We recently brought a load of pallets into our garage to use for projects. I found this article via Pinterest and checked our pallets today. Two of them were treated with MB! So glad we came across this article before using our pallets. HI MJ! Thanks for letting us know the article helped! Now we can’t wait to see what you do with that load of pallets. Keep us posted! Happy Palleting – HS. I had no idea that wooden pallets were so intricate. Having some with the “KD” stamp sounds like it’d be nice, since they are kiln dried and safe to use. I just like wood, because you can recycle them and be good to the environment. That’s a big deal for me! The scare over methyl bromide! What rubbish! MB is a gas. Like a fart, people. It dissapates into the atmosphere. There is no residue in wood or soil treatred with the gas, once it has dissapated. This occurs very quilckly. Thanks Eric. Among the many articles saying “oooh don’t touch MB pallets” are just a few stressing that MB is used as a gas. It’s boiling point is actually 4.0°C so unless the pallet has come to you directly from the fumigation plant and been kept just above freezing… it’s long gone! NB. I reserve the right to be wrong and would appreciate someone with serious knowledge on the subject chiming in. :) I suspect the biggest hazard is mold spores from pallets that have been stored outside — followed by other substances the wood has been exposed to. I was checking for these stamps on the pallets i just picked up, however, there were non to be found. I only found 3 stickers, one being a QR code and the other two were T#-S# and have barcodes. How can I find out if these are ok? Thanks for the response, i appreciate it! If pallet has EPAL and EURO stamp, is that safe? I have a pallet marked TP. Is this safe for indoor or outdoor? I have one pallet that says CSR H3. I’m in Australia. Just wondering if this means the company that checked it. I can’t see any other markings so presume it isn’t HT. Only got six pallets today before I read this article and only 2 say HT and being in Australia there isn’t any guarantee they haven’t been MB treated. They were free from Bunnings and if I’m not going to use them I’ll have to dispose of them. Very sad if I have to get rid of them as I would presume that therefore I shouldn’t use any pallets. Thanks for pointing out that the IPPC logo stands for International Plant Protection Convention. You also said that some wooden pallets go through a process of heat treating. I think it’s important to choose a pallet company that uses quality materials for their pallets so that they can be reused for projects and other crafts. The pallet has a 1-HG. What does that mean? I have a pallet with 534 burned into the support runner, what does that mean? I have several pallets i got outside a building with several businesses in it that were all marked with RHINO 24814 and a couple have 810T2-9-16 I would really love to use these for an indoor project, does anyone have any clue if these are safe? HI – Heather the admin assistant here – Are there ANY other stamps/markings on them? Are they any particular color (like red or blue)? Could you snap a picture of those codes so we could see if we can match them please? We’re always trying to expand our information on pallet safety, and you’ve got me very curious! You can email the pictures directly to me – 1001pallets.heatherstiletto@gmail.com and I’ll see what I can find! Thanks – and Happy Palleting! Merci pour ces infos, mais pour être tout à fait sûr de ne point se tromper ? Existe-il la version française ? Hi I am a little confused about using imported pallets in Australia. 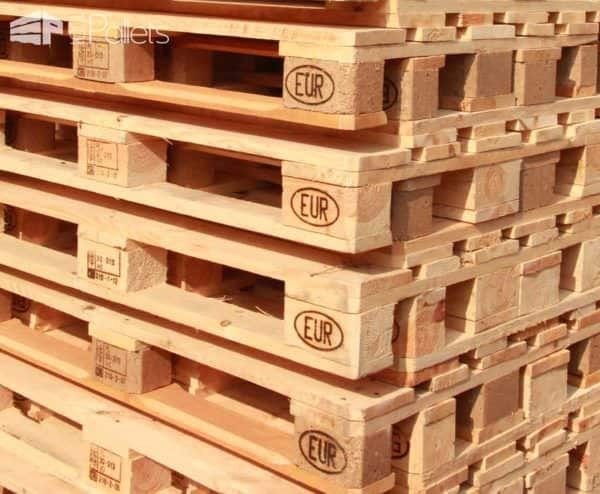 According to the department of agriculture ( http://www.agriculture.gov.au/import/goods/timber-packaging) imported pallets made from solid timber treated in accordance to ISPM15 standards are exempted from further treatment provided relevant documents are accompanied. This is in conflict with the stickied post and I’m rather confused. If anyone can help clarify this issue would be greatly appreciated. We here at 1001pallets.com are also hearing conflicting information. We’ve been told that they are spraying pallets regardless…yet their policies as you’ve shared say that some pallets are exempted. We’d love it if anyone has an “in” with any of the governmental agencies in Australia and could get clarification. If you find out, we’ll feature your information! :-D Thanks! Does that mean that we can never use pallets in Australia since they seem to be all fumigated with Methyl Bromide?? Oh wow, thank you for class 1001pallets! I figured there was a reason for colors, letters and numbers. Got a little nervous about using them. Again thank you for the info. Will pass this on to my pallet loving friends! How about the epal pallet composite blocks, are they safe to use in crafting or burning? If they are safe what method do you suggest to keep them from chipping off. If they’re aren’t safe how do we get rid of them? in my wood working practice where producing wooden pallets for the purpose of packaging and material handling of products. If you have no information on the pallets (stamps, color…), avoid to use them for any project. Hello, on the pallets that I have there are Chinese letters. Can anyone help me with that because I would like to build a bed?! Hi Jana, I would not use Chinese pallets for a bed are a lot of them are treated with chemical products, you should avoid them for indoor use. Very good info :-) Great !! Thanks Natesh, we try to provide good information on pallet safety and we try to improve this article regularly with any useful information we found. Hello, it’s really useful information. Hi Phatty, thanks for you kind message! I was so excited to find your extremely helpful page today. I am very interested in building small pieces using pallets, mostly to keep them out of the landfills. But I wanted to be able to use some as planters for organic herbs, veggies, etc. My concern was in knowing what pallets I could and couldn’t use, if I was going to grow food in them. Thank you so much for your information. You’re welcome Melissa :) Did you made your planters? Thank you so much for that work. I know now how to choise my palett. The tutos are great. I hope I will send you one of mine soon. Im looking to do a pallet deck bench for my patio. I got some pallets from a business close but they dont have any of the stamps you have in your article. All it has is a stamp with “CHEM” on it. The pallets look pretty new with no spill stains on them. Any feedback would be great. I live in Vancouver, Canada if that helps. Pallets arriving in New Zealand will be treated with methyl bromide too, so your warning for Australia should be expanded to Australia. And no wood is safe for burning. It doesn’t matter if it’s untreated or not. Woodsmoke is carcinogenic and cardiotoxic. All woodburning should be banned in residential neighborhoods. If you don’t agree go and look at the large body of scientific evidence on the carcinogenic, cardiotoxic, mutagenic and teratogenic effects of woodsmoke. Thanks Matt for the info concerning pallets in New Zealand, I will add it to our warning. Thank you so much! The pdf is great! I knew there were different types of pallets, but I am new to using them, and needed an easy way to be able to pick the correct type! (or send my husband to get the correct type! ;) )Thank you!